Ah, tofu. Where would non-meat eaters be without this protein-packed food? It’s the poster child of versatility, especially when you consider that it’s available in a variety of thicknesses. Silken tofu makes for an awesome sauce, but when it comes to the extra firm kind, you can be sure that I’m making baked breaded nuggets. And since they call for flour, why not add an extra dose of nutrients with something like Nature’s Earthly Choice’s Ancient Grain Flour? It contains a blend of coconut, teff, and quinoa topped off with a probiotic boost. Add your favorite spices and bread crumbs, and you’ve got an addicting and healthy vegan appetizer. Pre-heat the oven to 400 degrees Fahrenheit. Drain the tofu, then slice each block 4 times length wise and 4 times width wise to create 32 cubes (or 16 from each). Pat dry. In a small bowl, combine the bread crumbs, flour, and spices. 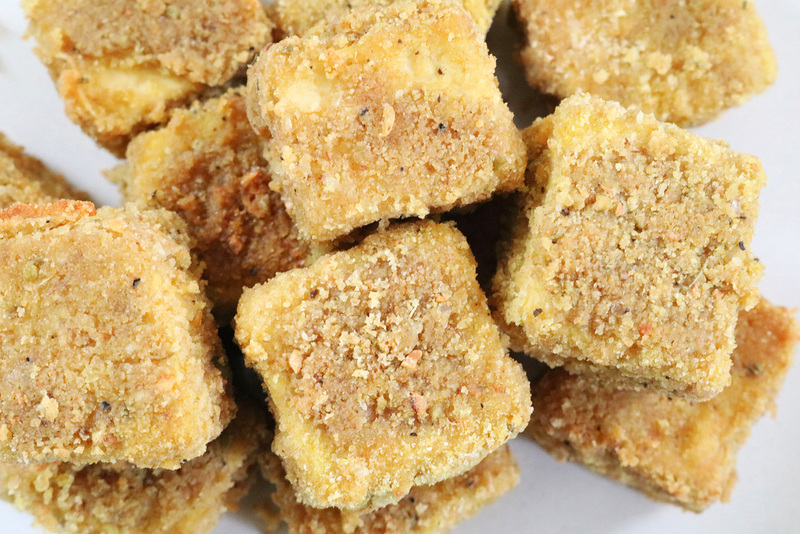 Dunk each cube into the olive oil then coat with the dry mixture. Make sure all 4 sides are covered. On a greased baking sheet, arrange the nuggets in rows. Bake for 20 minutes, flip, and bake for another 20 minutes. Serve warm with ketchup, hot sauce, or avocado mayonnaise. To learn more about the Ancient Grain Flour with probiotics by Nature’s Earthly Choice, head to their website. You can also find more recipes made by yours truly, right here!